A Gaucho is a resident of the South American pampas, or Patagonia Grasslands, found mainly in Argentina, Uruguay, Paraguay, Southern Brazil, and Southern Chile. Their main duty is to herd cattle all year long. Why am I telling you this? Because Francisco told me this is what I looked like, when I emerged from my closet wearing this getup. Maybe it was the looser-than-usual top, or the costume-y scarf but I for one, felt a little cool- it felt different from the typical SF uniform- something I like to pride myself in not partaking in. But then to find out this "look" was already trademarked by the South Americans and half of Latin America- only goes to show fashion really is cyclical, and most of it has already been "done"/worn by someone else. 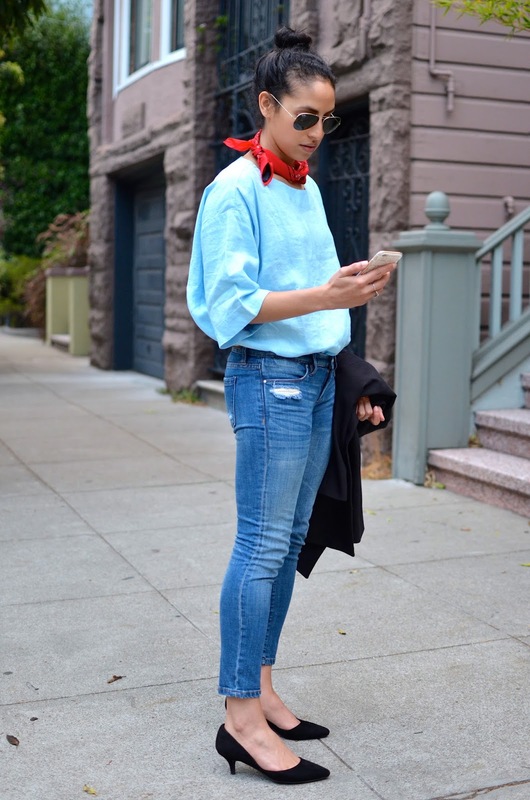 Speaking of fashion- I do love this baby blue hue with a pop of red, it compliments nicely. 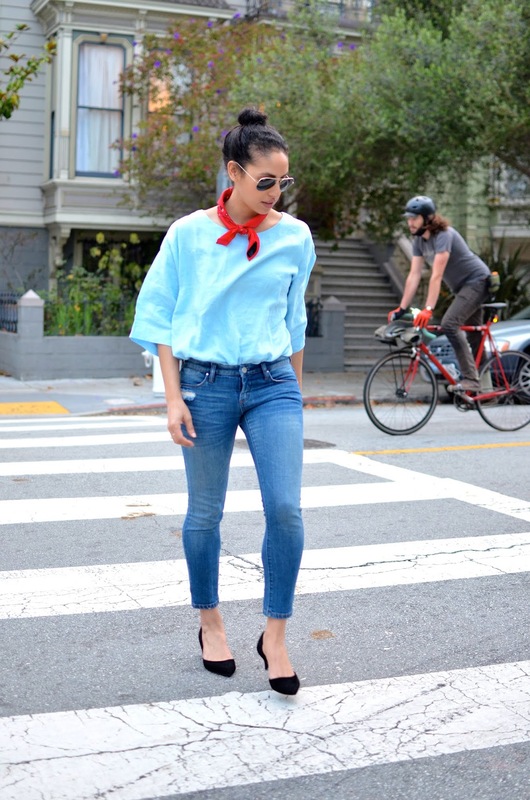 Paired along with a cropped skinny jean, a slim kitten D'Orsay heel, and a sleek car coat- turn this look into less costume and more country-meets-city-chic. Gotta find my bandana STAT! black is my favorite color! like you shoes! 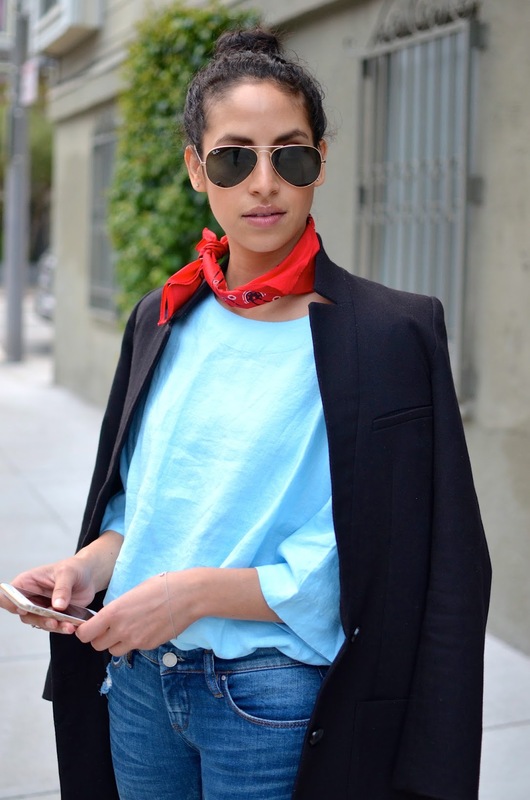 LOVE, love, love your little ascot! This look was made for you -- you pull it off so dang well it's ridiculous.